The next day, Chinese President Xi Jinping gave a speech marking the 40th anniversary of the 1979 “Message to Compatriots in Taiwan,” in which the Fifth National People’s Congress — under strongman Deng Xiaoping — first started to push for “reunification” (on China’s terms) after the normalization of U.S.-China relations. President Tsai Ing-wen immediately firmly pushed back by rejecting the “One country, two systems” outlined by Xi, and by emphasizing that her government has never accepted the “1992 Consensus”, which was presented by Xi as basis for cross-Strait relations. For a full discussion of the exchange, see the article in the Diplomat. In November 2018, Taiwan held local elections for positions of city mayors, county magistrates, and county, city and local councils. The outcome was a strong disappointment for President Tsai and her ruling DPP government and reinvigorated the opposition Kuomintang. The issues in the election were local issues, but many observers saw the win for the KMT, which wants closer ties with China, as a possible shift in public opinion. In January 2020, one year from now, Taiwan will hold its presidential and legislative elections. This means that both the ruling DPP and the opposition KMT will go through the process of selecting their respective candidates in the coming five months. This process will involve lots of rambunctious public debate on how to approach China: maintain the present cautious but firm line as set out by President Tsai or nudge closer to the Beijing regime (as the KMT will want), or distance Taiwan further from China (as President Tsai’s deeper-green supporters will want. The outcome of the elections will set the stage of how Taiwan will approach cross-Strait relations for a long time to come. In the meantime, China’s relationship with the West, and the US in particular, will be tumultuous as best. The trade and tariff war will grind on; the West will continue to be upset about China’s technology theft, violation of property rights, expansionist moves through the Belt & Road. At the same time, China’s economy is slowing, its repression in East Turkestan is meeting increasing resistance, while its moves in the South China and East China’ Seas is meeting pushback from the surrounding countries. All adding up to multiple sources of tension for the Chinese president. In this context, what can we expect to happen in the coming year? Let us take a look at the driving forces for each of the main actors. For President Tsai Ing-wen the main objective will be to maintain a balanced trajectory for Taiwan. For this, she needs to be the DPP’s candidate for the presidency and needs to be re-elected. In order to achieve the first objective, she needs to bring the coalition of middle of the road and progressive supporters that brought her to power in 2016 back together. For this, she will focus on a number of key reforms that will reinvigorate her power base: probably transitional justice, judicial reforms, and stimulating the economy. On cross-Strait relations, she will continue the firmer line set in with her New Year’s speech, emphasizing Taiwan’s democratic consensus, and pushing back against China’s attempts to isolate Taiwan and push it into a corner. One can also expect more measures to strengthen the defence and security of Taiwan, arms purchases from the US in combination with indigenous development of asymmetric weapon systems. For the Kuomintang Party, they key is to come up with a viable candidate for the presidential race. The party was reinvigorated by its very positive results of the November 2018 mid-term local elections, but it remains to be seen if it can translate this into a strategy for the presidential race. In the past, it has too often titled in China’s direction, to the detriment of the Taiwan-cantered philosophy favoured by the majority on the island. In addition, the headiness prompted by the outcome of the November elections has prompted quite a number of party leaders to contemplate running for the presidency. A problem is that the Kuomintang – in contrast to the DPP – hasn’t set out clear rules for candidate selection. The process might thus be rather messy, like it was in the run-up to the 2016 elections, when Ms. Hung Hsiu-chu was selected candidate, only to be dumped a few months later in favour of Eric Chiu. At this point Party chairman Wu Den-yi and Mr. Eric Chiu are the favourites, but Mr. Wu is a rather colourless campaigner, while Mr. Chiu ran in 2016 and lost rather badly to current President Tsai, by a ratio of almost 2:1. As always, there is a dark horse: former President Ma Ying-jeou is often rumoured to want to run again, but he is generally also seen as a “has-been.” The only “new-kid-on-the-block” is newly-elected Kaohsiung mayor Han Kuo-yu. However, he doesn’t have the necessary seniority in a party that still runs on older dogmas. The third key player is the Beijing government under President and CCP Party Chairman Xi Jinping. Mr. Xi gave his opening salvo with his January 2nd speech, but that ran into President Tsai Ing-wen’s firm opposition, and inadvertently gave her a significant boost in her opinion polls. In the coming months, Mr. Xi can be expected to keep up the pressure, but experience has shown that this will only solidify opposition in Taiwan to China’s efforts. In terms of international space, any further moves to pick off diplomatic partners or restrict/exclude Taiwan from participating in international organizations will meet with a broader international effort to support Taiwan, particularly in organizations like ICAO and the World Health Organization. In 2018, the US already spoke out strongly (“Orwellian nonsense”) against China’s efforts to isolate Taiwan. It is expected that this push-back will intensify if Mr. Xi Jinping continues his efforts. By the same token, China’s efforts to intimidate Taiwan through circumnavigation flights and ship manoeuvres is increasingly seen by the United States as an “… effort to determine the future of Taiwan by other than peaceful means, including by boycotts or embargoes, a threat to the peace and security of the Western Pacific area and of grave concern to the United States;” — the condition in the Taiwan Relations Act that will prompt US action. As a clear signal to China, just recently, Admiral John Richardson, the US Chief of Naval Operations, refused to rule out that a US aircraft carrier would pass through the Taiwan Strait. In addition, Mr. Xi will have his hands full with other problems: China’s economy is slowing down considerably, which will lead to increasing internal tensions. Some analysts suggest that this may lead to a bursting of the property bubble. Aggravating the problem is the continuing trade and tariff war with the United States, and the tensions over Huawei: not only the case of the arrest of its CFO Ms. Meng Wanzhou and the repercussions of China’s arrest of two Canadians plus the sudden death sentence of a third Canadian, but also the increasing push by many countries to exclude Huawei from building 5G infrastructure. The latter would mean almost certain bankruptcy for the company, which would be a major blow to China global ambitions and its Belt & Road initiative. What does all of this mean for Taiwan in 2019? It will be an eventful year, particularly in the run-up to the January 2020 elections. But it is unlikely that Mr. Xi Jinping will attempt any decisive moves: that would simply add to the already high instability he has to deal with. 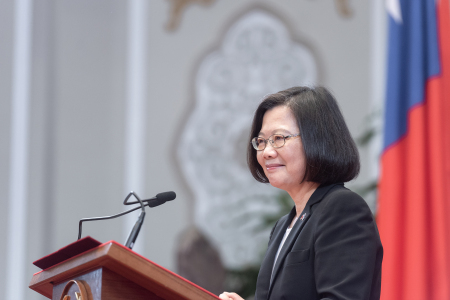 President Tsai has in the past been adept at adapting to new circumstances, and it is likely that she will be able to cobble together a coalition to support her in the elections and overcome any challenge the Kuomintang will be able to muster. From the international community, in particular the US, Canada, Europe, Japan, India, Australia and New Zealand we can expect a new awareness of Taiwan’s international predicament, and more support for Taiwan’s international space and substantive bilateral relations. The 1995-96 Taiwan Strait Crisis: Three What Ifs? I agree with the open-ended nature of the Presidential election politics. It is unclear who the candidates will be, though you seem to be sure that Tsai will be the candidate. However, concerning the National Assembly elections, I expect the DPP to lose a considerable number of seats. I agree with your assessment about the international space. Glad that the WHO advocacy began already by Taiwan’s friends.